The photograph was taken by John Faber of Mountain Lakes N.J. and appeared in the N.Y. Times. This photo was taken to accompany an article written by the Dalai Lama as an appeal to the governing forces of the Peoples Republic of China, asking for free and unrestricted access to Tibet. 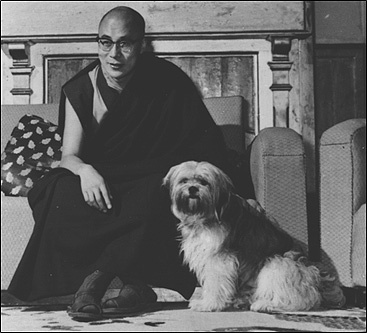 The photographer during a photograph session with the Dalai Lama in Dharmsala, indicated that quite unexpectedly the Dalai Lama’s Tibetan Terrier ‘Senge’ escaped into the room.